Minister of Internal Transport Ranjith Madduma Bandara and a delegation participated at the Japanese Forum for Global Property Innovation and had a bilateral discussion with his counterpart, Minister of Land, Infrastructure, Transport and Tourism of Japan Akihiro Ohta, among others. Bandara and the delegation were invited by the Ministry of Land, Infrastructure, Transport and Tourism (MLITT). Bandara delivered the Country Statement at the Urban Strategy in Asian major cities at the Japanese Forum, followed by a presentation by Ministry Additional Secretary Thilakaratne Banda. The Country Statement focused primarily on strategies to enhance connectivity between and among urban and rural cities of Sri Lanka. He accentuated the fact that efficacious connectivity and systems of transportation would lead to rapid economic and commercial advancement. The Ministry of Land, Infrastructure, Transport and Tourism is a vast and highly diverse Ministry and is considered as a critically vital and seminal ministry in Japan. During the discussion between Bandara and Ohta, the two Ministers discussed myriad issues ranging from 2020 Olympics, cooperation and assistance extended by Japan during the last six decades, monorail transportation system, other modes of transportation and the newly-elected administration of Sri Lanka. Bandara expressed sincere gratitude on behalf of the Government of Sri Lanka for the cooperation extended by Japan in addressing the reconciliation, rehabilitation and reconstruction process with efficacy in the country. He added that Sri Lanka had today entered a new decade in its political journey with the election of a new Government and was endeavouring to seize the economic, commercial, financial, touristic and diplomatic vistas and opportunities in order to elevate Sri Lanka as a rapidly developing country. Ohta stated that Sri Lanka and Japan had been maintaining most cordial and congenial relations for well over six decades. Ohta added that Sri Lanka was now well poised to be a rapidly developing nation in Asia. Bandara and the delegation also had discussions with Japan International Cooperation Agency (JICA) and with senior officials of MLITT, particularly to explore possibilities to construct a monorail transportation system in the city of Colombo. The Minister also conducted discussions with Hitachi Corporation Executive Vice PresidentKoji Tanakaand his delegation. 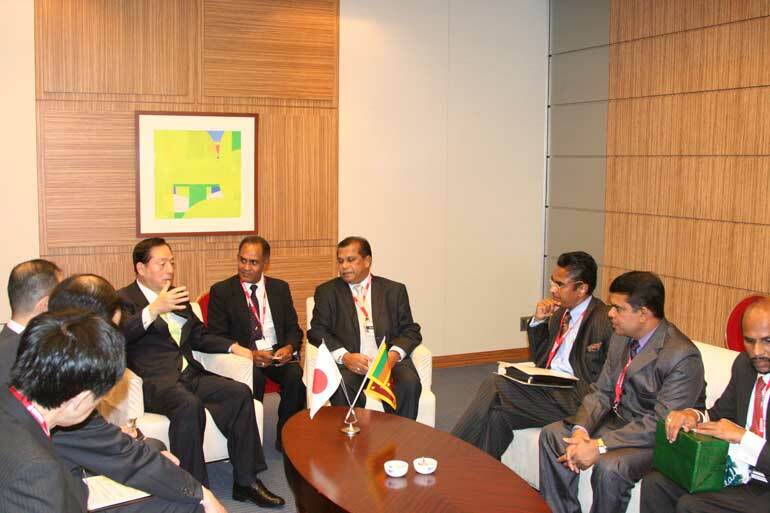 Tanaka visited Sri Lanka along with the corporate contingent of Prime Minister Shinzo Abe in September last year. These discussions too were focused on advancing internal transportation and connectivity in the country. The Charge d’ Affaires of the Embassy Dr. A. Saj U. Mendis, Ministry of Internal Transport Additional Secretary Thilakaratne Banda, Private Secretary Gamini Rathnayaka and Board Director of the Ministry of Internal Transport Srilal S. Withana were present during the meetings and discussions.